Studies show that consumers rank unpleasant odor as a top annoyance, even over poor customer service. 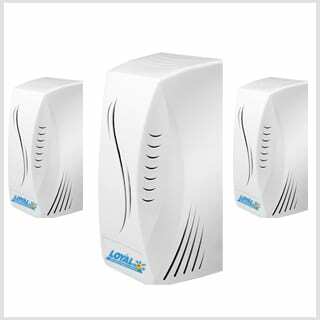 Our complete line of air freshening products include urinal and bowl cleansers, urinal screens, and auto flush units. Choose from a variety of pleasing scents like Cinnamon, Raspberry, Grapefruit, Tropic Wave, Citrus Blossom, Pure Linen, and English Garden. Our standard size air freshening dispensers come in either black or white and feature three-way ventilation for maximum air flow. Our sleek black & white micro dispenser features a battery-free fan dispersion system with 100% recyclable refills. Every dispenser comes with a lifetime guarantee so you will never need to pay for repairs.